It's party time whenever there's a Full Moon in Aquarius, and the fun-loving Full Moon on August 1, 2012 is no exception. 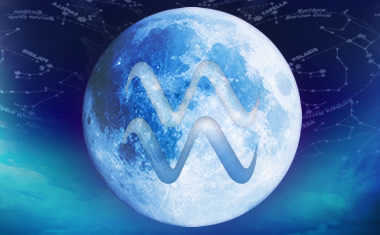 Full Moons signal an increase in activity and energy, and Aquarius is one of the most friendly and agreeable zodiac signs. Together, this amounts to a busy time full of social engagements and stimulating conversation. Even better, the Aquarius Full Moon's opposition to the loving Leo Sun will put us in a joyful mood, and Jupiter is upping the happy-ante with pleasant aspects to the Sun and the Moon. Our curiosity will peak during this Full Moon, too, because Mars in Libra trines the Moon and makes us even more eager for new people and new experiences. This aspect takes a Full Moon that's already about socializing and kicks it up another notch, which is why we say it's time to break out the party hats! If there's anything to watch out for with this mostly wonderful Full Moon in Aquarius, it's spreading yourself too thin or getting carried away with too much ungrounded enthusiasm. You know how it is when you're having so much fun you forget to pay attention to important details? Then someone gets hurt or something gets broken? We don't want that. That's what could happen with this super-social Full Moon in Aquarius, so try to enjoy this playful time, but do a mental check-in every once in a while to make sure you're not overdoing things or accidentally slighting someone while you're in party mode.